Scotland's First Minister Nicola Sturgeon has warned about the dangers of a "miserable" EU referendum campaign by the 'remain' side, urging instead for a drive which inspires the public. In a lunchtime speech to industry group Women in Advertising and Communications London (WACL), Sturgeon, who is campaigning for the UK to stay in the EU, outlined why she believed that a positive case should be made for the country’s continued EU membership. Taking a swipe at the ermain effort, which is led by PM David Cameron, Sturgeon claimed: "Miserable and negative fear-based campaigning isn’t very effective." She pointed to the way the unionist vote fell away during the 2014 Scottish independence campaign, claiming those on the ‘No’ side "squandered a 20-plus point lead in the opinion polls" because of their negative focus. The EU referendum, she said, offered the opportunity to leave a "positive legacy of democratic engagement" in a similar way to the ‘Yes’ push in Scotland. "Let’s make it a positive campaign that seeks to inspire people to stay," she urged. 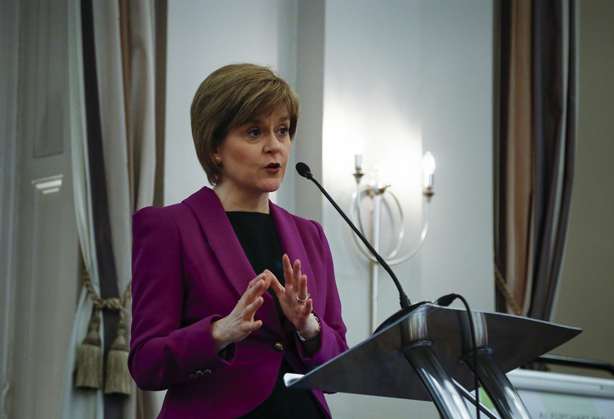 During the speech, given at London’s Savoy Hotel, Sturgeon also turned her attention to gender equality. Sturgeon, who is Scotland’s first female First Minister, revealed that when she announced her 50/50 gender split cabinet she received several letters from men and women querying whether the women were good enough for their roles. But she didn't get one letter questioning whether the men deserved their place. "We owe it to the next generation to win these battles," she said. What was needed, she said, were more positive role models and a critical mass of women in positions of power. Treading carefully in an effort not to be seen as endorsing a candidate, Sturgeon said the election of a female US president would be "absolutely incredible". But in a reference to Margaret Thatcher, Sturgeon noted that the former PM "didn’t go out of her way to make politics a more welcoming place for women". This story originally appeared on our sister site Marketing.